When a new puppy is added to the family, everyone can chip in and help raise the new family member. This includes the smallest of children. 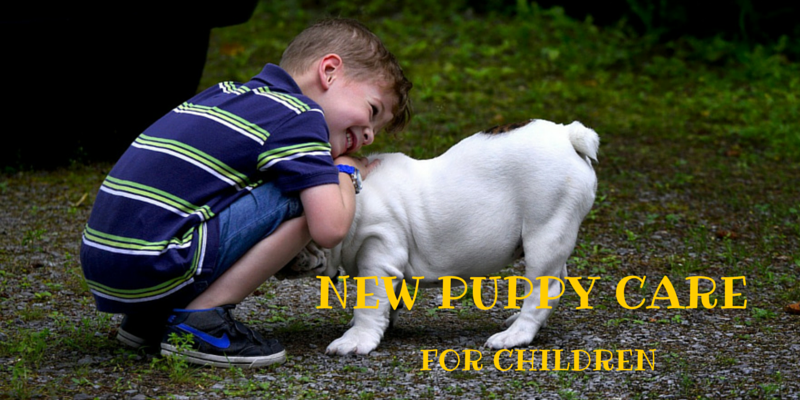 It’s important to give children a chore or task related to helping ensure the new puppy’s needs are met; this makes the child feel like part of the puppy raising process, and avoids jealousy. Children can put out food and water for the new puppy. It’s important to show a child exactly how much food to put out, so the puppy gets enough to eat without getting overstuffed. Older children can also help clean food and water dishes. Children can also take the new puppy out to potty. This will help a child learn what signs to look for when the dog needs to go outside, to help avoid accidents in the house. This is the most important task that you can assign to your child. All pets need lots of love and affection. Most dogs are happy to just snuggle and spend time with humans, and all children can do this task. Larger and more energetic puppy breeds will need to be walked or have outside play time. They may also want to play fetch or tug with toys; older children can be part of these games. Above all, it is important that you supervise your child with a new puppy. This helps protect your child as well as the puppy, and keep accidents from happening. Even the most docile dog can snap when cornered or feeling afraid. When you take the time to ensure that your new puppy is properly introduced and integrated into the existing family unit, you will ensure a forever match for you, your family members and the new puppy. Written by Maggie. Maggie volunteers for four dog rescues and three animal shelters.